Masks are created upon order. Please allow two to three days for production before shipping. Thank you. 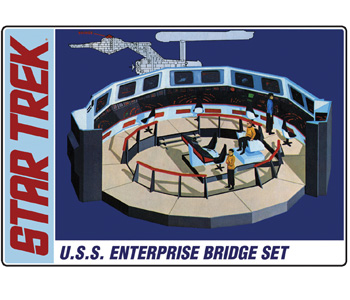 TOS COMMAND BRIDGE paint masks for your AMT/Round2 model kit. What do you get? You get four pages of paint masks that provides masks for all the screens and consoles for all the bridge stations, including the helm and wall panels. Unlike other mask makers, we provide extra masks for almost everything in the set. Most mask placement doesn’t require any transfer tape, but we include several pieces of tape just in case you need it. Most all of these masks can be removed from the mask sheets with the use of #11 Exacto blade and placed on the model and then rubbed down in place without the use of transfer tape. You may choose to transfer some of the larger masks with transfer tape. To do this, you need to apply the transfer tape to the mask and rub the tape down where the is not bubbles or spaces left. You then use the tape to pull the mask off the backing material by pulling back the tape over itself very slowly to make sure the mask comes of onto the tape. Sometimes you’ll have to push the tape back down and rub the transfer tape back onto the mask. This may take several tries to get it right. You then apply the mask on the tape to the kit part and rub the tape/mask down until there is no air voids left. Then slowly peel the tape off leaving the mask on the part. This can take several tries to get the mask to set. Peel slowly, rub back down, peel, rub, peel until you can remove the tape with the mask left on the kit part. PAINTING: These masks have been designed to work with the kit decals which means that the mask is slightly smaller than the kit decal so you can place them, prime, paint, and then remove them from the model and add the decal to the unpainted section so that it can be lit from behind through the kit plastic. This technique works with the new re-popped kit from AMT/Round2. Masks are also compatible with the use of the Paragrafix photo etch set and will work for general masking for the original kit. Some trimming and fitting may be required. The use of painting masks is considered an advance modelling skill and may require practice to master. 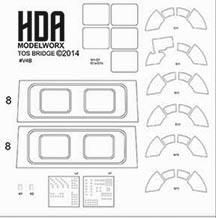 MULTI-COLOR PAINT MASKS for the the 1:350 Scale Refit/A Enterprise Model kit by HDAmodelworx. COMING SOON!